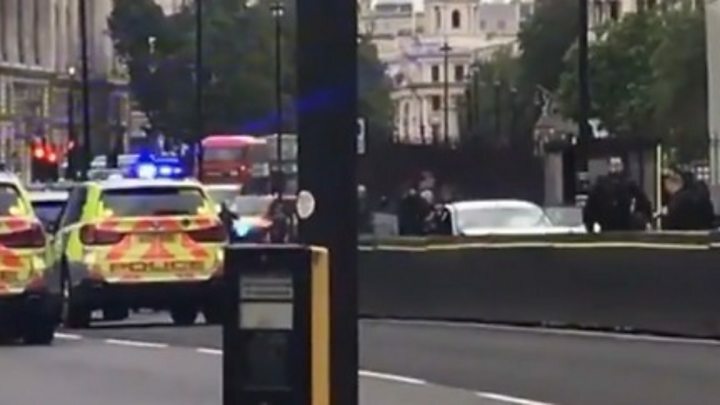 A number of people have been injured after a car crashed into security barriers outside the Houses of Parliament, Scotland Yard say. Scotland Yard cannot say if the incident is related to terrorism at this stage. Members of the public and press have been moved further back from the area as police put up a Terrorism Act cordon, officers at the scene said. Parliament is currently not sitting. Images posted to social media showed a man in handcuffs being led away from the car by officers. He added: “Paramedics are treating a small group of people sitting on the ground outside the Palace of Westminster. Euronews/NBC UK correspondent Vincent McAviney earlier tweeted a video of the incident as it unfolded.